The GDP deflator is a measure of the price level of all domestically produced final goods and services in an economy. 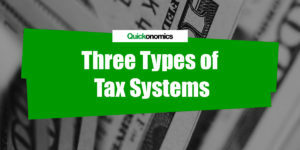 It is sometimes also referred to as the GDP Price Deflator or the Implicit Price Deflator. The GDP deflator reflects changes in the average price level within the economy. 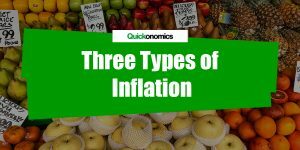 Therefore, it is commonly used by economists and policy makers as a measure of inflation, together with the Consumer Price Index (see also GDP deflator vs. CPI). Specifically, the GDP deflator measures the current price level of domestically produced goods relative to the price level in a specific base year. 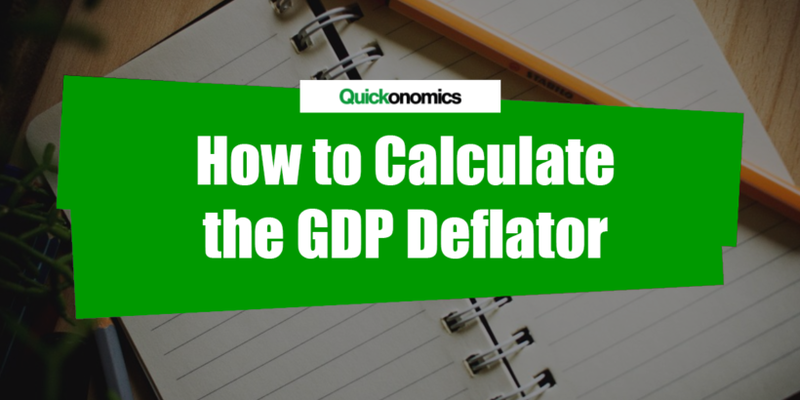 Thus, calculating the GDP deflator follows a three-step process: (1) calculating nominal GDP, (2) calculating real GDP, and (3) calculating the GDP deflator. 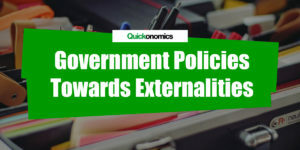 Nominal GDP is defined as the monetary value of all finished goods and services within an economy valued at current prices (see also Gross Domestic Product). So this part is pretty easy. All we have to do is multiply the quantity of all goods and services produced with their respective prices and add them all up. To give an example, think of an economy that only produces ice cream and candy bars. The table below shows the quantity produced and prices of both goods for three consecutive years (2015, 2016, and 2017). If we calculate nominal GDP as described above, we find that for the year 2015 it amounts to USD 400,000 (100,000*2 + 200,000*1). Meanwhile for 2016 nominal GDP is USD 740,000 (120,000*2.5 + 220,000*2) and for 2017 nominal GDP amounts to USD 1,290,000 (150’000*4 + 230,000*3). In a second step, we can now calculate real GDP. Unlike nominal GDP, real GDP shows the monetary value of all finished goods and services within an economy valued at constant prices. That means, we chose a base year and use the prices of that year to calculate the values of all goods and services for all the other years as well. This allows us to eliminate the effects of inflation. In our example, we’ll pick 2015 as our base year. Thus, the reference prices of ice cream and candy bars are USD 2.00 and USD 1.00, respectively. Starting from there, we can now calculate real GDP for all three years. In 2015 real GDP amounts to USD 400,000 (100,000*2 + 200,000*1). Note that in the base year, real and nominal GDP are always the same because we use the same prices when calculating them. Meanwhile, for 2016 real GDP is USD 460’000 (120,000*2 + 220,000*1) and for 2017 it amounts to USD 530,000 (150,000*2 + 230,000*1). If you compare these numbers to the numbers we calculated above, you can already see that real GDP doesn’t grow quite as much as nominal GDP. Going back to our example, we can quickly see that the GDP deflator for 2015 is 100 ([400,000/400,000]*100). The GDP deflator for the base year will always be 100, because nominal and real GDP have to be equal. However, things become more interesting when we look at the the following years. For the year 2016, the GDP deflator is7 160.9 ([740,000/460,000]*100). That means, from 2015 to 2016 the price level has increased by 60.9% (160.9 – 100). Similarly, the GDP deflator for 2017 is 243.4, which reflects a price level increase of 143.4% compared to the base year. The GDP deflator is a measure of the price level of all domestically produced final goods and services in an economy. It is sometimes also referred to as the GDP Price Deflator or the Implicit Price Deflator. It can be calculated as the ratio of nominal GDP to real GDP times 100 ([nominal GDP/real GDP]*100). This formula shows changes in nominal GDP that cannot be attributed to changes in real GDP. Hence, the GDP deflator is often used by economists to measure inflation, together with the Consumer Price Index (CPI).